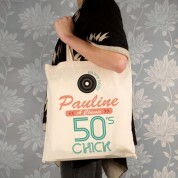 Any 50's chick will love to receive this retro, stylish shoulder bag. 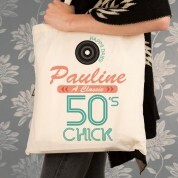 It reads the recipient's name followed by "a classic 50's chick." 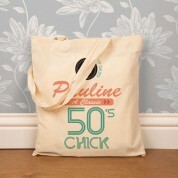 A vintage record and pink and turquoise text completes the design. Suitable for taking out and about when shopping or travelling. It is a statement accessory that she can treasure for years! An extra special gift idea for a Birthday or Christmas.